By the end of January I was fed up of looking through the empty pages of our diary and decided we needed to make an immediate plan to cheer ourselves up. 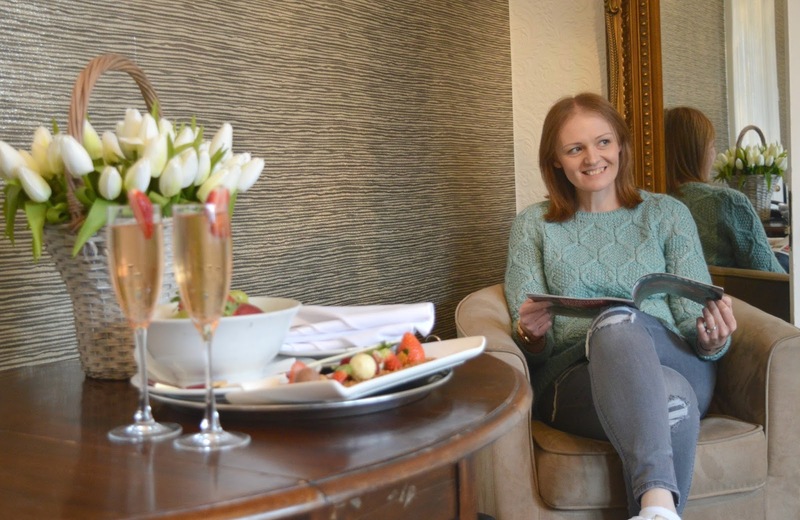 Remembering that we had a voucher for a staycation hanging about, it seemed like the ideal time to book ourselves into somewhere beautiful and relaxing. 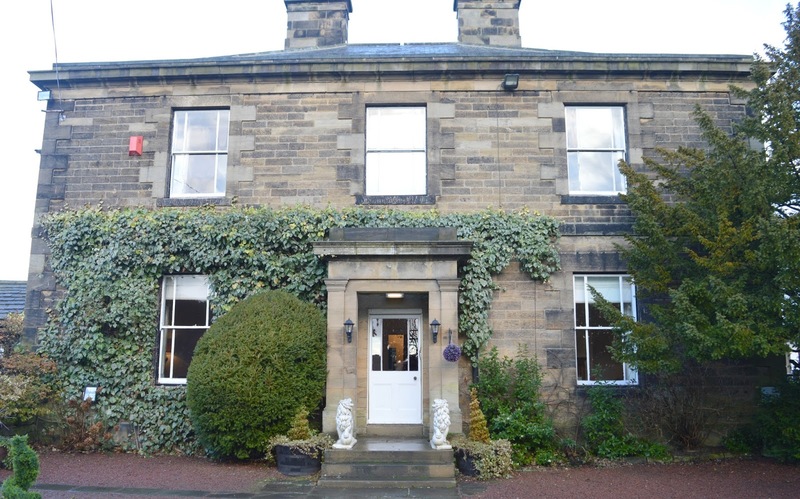 Not wanting to travel too far we decided on Horton Grange, a country house hotel in Northumberland a few miles from Newcastle. 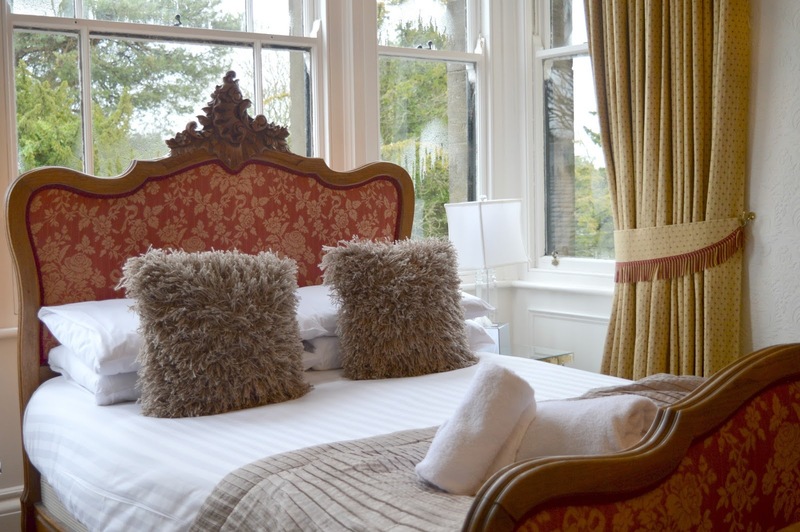 We have visited Horton Grange once before when Simon treated me to a birthday meal there but it was our first time staying over and we were keen to see what the hotel had to offer for a Winter staycation. 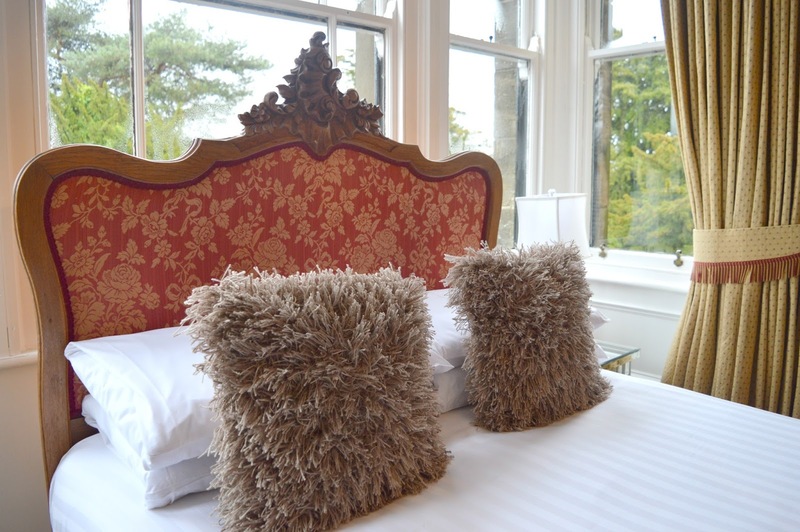 Horton Grange Country House Hotel is a privately owned Grade II listed building with nine ensuite bedrooms, a restaurant serving up delicious meals and a lounge complete with open fires and the all important afternoon tea menus! We checked in on a very wet Saturday afternoon, scurrying from the car with our luggage at top speed to avoid a soaking, it was, without a doubt, the perfect kind of weather for a staycation. Nothing beats shutting yourself away in a beautiful hotel where you can stay cosy and dry whilst watching the rain out of the window - am I right? We were shown to our room by the very lovely Deputy General Manager, Mo who helpfully picked up my bag and carried it up the stairs, despite my protests (I always worry people will judge my heavy luggage for a one night stay!). 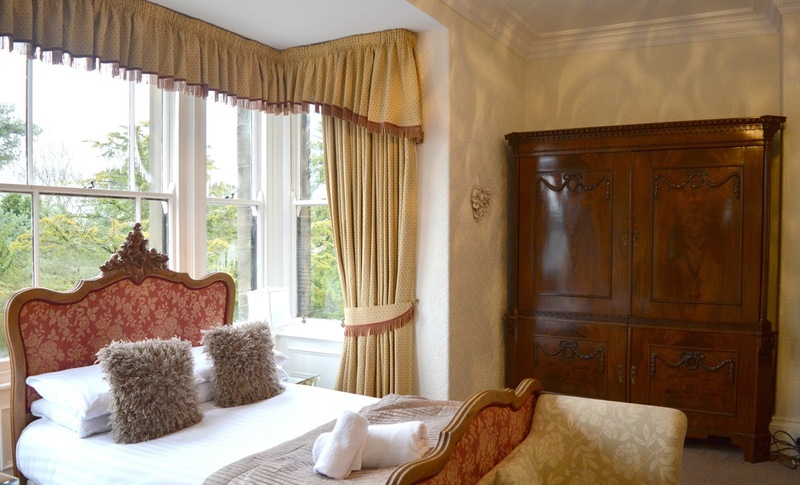 Staying in the Winter definitely paid off as the hotel was relatively quiet which meant an upgrade to the Alnwick room, a beautiful Executive room that we later discovered is often used as the bridal suite. As soon as the door swung open I was mesmerised by the beautiful features in our room. The dark wooden wardrobe reminded me of the antique furniture that my Grandparents used to have in their home and the ornate mirror and intricate carvings on the headboard of the bed all took my breath away as I explored our home for the night. The bed was the most beautiful feature with its stunning headboard and shaggy cushions (I immediately decided that I must get shaggy cushions for our sofas at home! ), it took all of our willpower not to just throw our luggage on the floor and jump straight in for a nap. As Simon settled down on the comfy chair for some laptop time I was appreciating the little North East touches to our room including locally produced Ringtons tea bags and biscuits (my favourite) and a great selection of local magazines (anyone else addicted to Appetite magazine?) Just as I settled down with an issue of Living North there was a knock on the door and we were presented with a complimentary food platter of fruit and chocolates and some glasses of fizz. What a lovely surprise and such a nice gesture! After a few hours chilling we decided to head downstairs for a little explore and found our way into the lounge that was filled with huge squishy sofas and open fires - the perfect little Winter escape. A couple of people had already settled themselves down for the afternoon, quietly chatting and enjoying an afternoon tea. Just as we began to get food envy we were surprised to discover that Horton Grange were treating us to an afternoon tea of our own. We had quite a shock, and were immediately glad that we'd worn stretchy pants and hadn't eaten too much during the day - an unexpected afternoon tea was quite the treat! We settled ourselves down on a sofa and started chatting afternoon teas with some lovely ladies next to us. 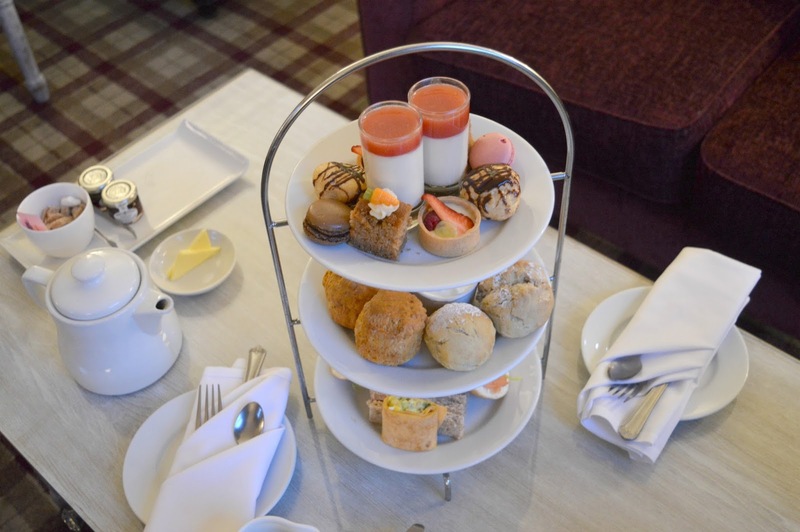 We shared our favourite spots and enjoyed discussing the best scones in the North East - they were very keen to let us know that the Horton Grange afternoon tea was one of the best they had tried so we knew we were in for a treat. With dinner booked only a few hours later we decided we'd better pace ourselves and slowly tackled the sandwiches (the mini cream cheese bagel was divine!) before moving up to the scones, deciding immediately that we'd best not eat three each or we'd never make it to our evening meal! What a treat getting three scones on an afternoon tea! Perfect if you can never quite decide which you like the best, at Horton Grange you get a cheese, plain and fruit with your choice of butter, jam and cream. It took a lot of willpower not to eat every crumb, they tasted so good. The top tier was as pretty as a picture with plenty of colour and delicious looking treats all homemade by the kitchen. Mini carrot and walnut cakes and fruit tartlets, macarons and chocolate choux buns, there was something for every taste and we made sure to try a bite of each before having to admit defeat. 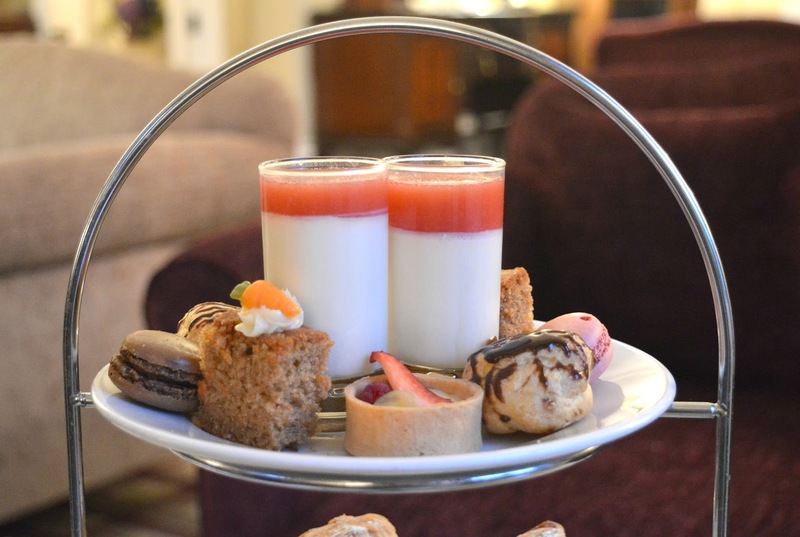 Afternoon Tea at Horton Grange costs £16.95 per person which is a bit of a bargain and if you really fancy pushing the boat out they also offer Prosecco or Champagne as an accompaniment or Gentlemans Afternoon Tea for that important Mr in your life. As you can imagine we were pretty full after all that food so we headed back upstairs for a little nap. 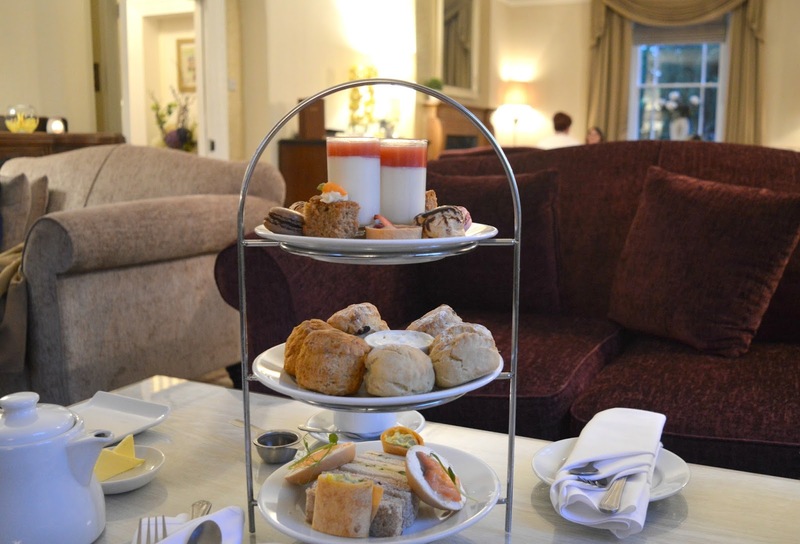 Having a room to retire to after afternoon tea is such a treat and made us wonder if we should always book a room for the night when we're indulging in a cake stand. We had a perfect 2 hour nap and woke up feeling refreshed and just about ready for round two - dinner! We made our way down to the small hotel bar and enjoyed a gin and tonic each (so happy to discover that Horton Grange have our favourite gin, Edinburgh Rhubarb and Ginger) whilst taking a look at the evening menu. Knowing we'd never be able to fit in a Starter we headed straight for the Main Courses where I struggled to make a decision because the restaurant were serving up so many of my favourite foods. How on earth was I supposed to choose between Steamed Seabass with Chilli and Ginger Noodles, Roast Butternut Squash and Wild Mushroom Linguine and Pan Roasted Duck Breast? 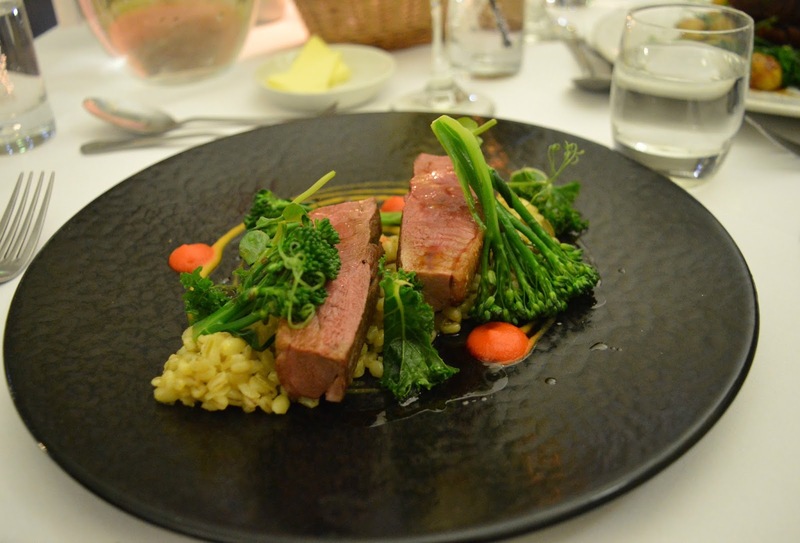 In the end I opted for the Duck Breast (£21.50) which came served with Barley Stew, Butternut Squash Puree and Red Pepper Coulis and Simon opted for Roast Rump of Lamb (£22.95) which came with Rosemary Roasted Potatoes, Fine Beans, Tender Stem Broccoli and Red Wine Jus. We made our way to our table and settled down for the evening. The restaurant was very quiet with only one other couple in the room and with no music playing it was a little awkward to start with, we were whispering our conversations! Luckily just as we polished off the bread basket the music came on and we instantly relaxed, it's amazing how much a little bit of music can change the atmosphere in a room. Our only disappointment during our meal came at the very start with the bread at our table being a little dry and the cold hard butter impossible to spread on it. I was a little sad as I do love a bread basket (it's the only time I allow myself to truly indulge!). Luckily the appearance of our main course dishes more than made up for it. Simon's Lamb was equally delicious and despite my bulging belly I managed to enjoy a forkful of meat and a tiny bit of the Rosemary roasted potatoes. I'd never order lamb when I'm out as I always worry that the meat will be tough but the dish at Horton Grange was spot on. Despite having only indulged in afternoon tea a few hours earlier we both managed to leave our plates completely clean. 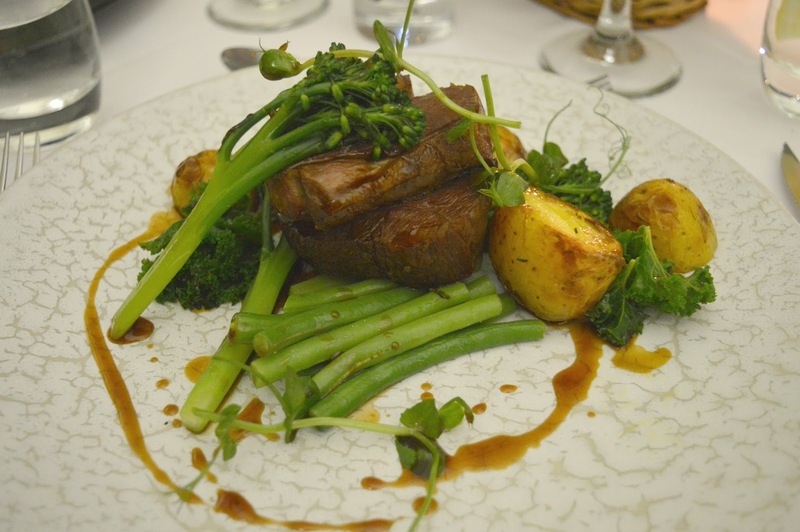 We both loved our meal and couldn't believe that we've never really heard anyone say how great the food is at Horton Grange - maybe it's a very well kept secret? 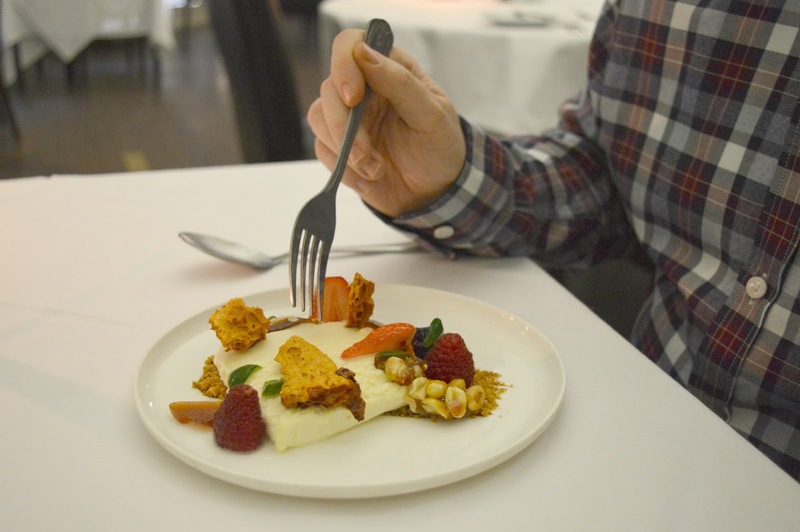 When it came to desserts my nut allergy meant I had to sit at the sidelines and watch as Simon ordered the Vanilla Parfait with Peanut Brittle and Honeycomb (£5.95). Despite being pretty full he decided that he could probably manage something light. Just as I was thinking to myself that I was quite thankful that the desserts weren't suitable for me, our waiter appeared with a special dessert that he'd created just for me guaranteed to be nut free. A beautiful plate of fruit, honeycomb and chocolate I was so touched by this lovely gesture. We fell into bed that night with very fully tummies and the overindulgence meant that we were fast asleep as soon as our heads hit the pillow and we didn't stir until morning - bliss! Our room felt extra cosy when we woke in the morning and it was such a struggle to pull ourselves out of bed, I think if it hadn't been for the promise of breakfast we'd probably still be there now! We enjoyed lovely hot showers although I was a little disappointed by the complimentary toiletries available in the room. We had a small shower gel and some shampoo and that was it - I hadn't packed any moisturiser as I usually just slather myself in whatever is available in the hotel room. Breakfast was served in the restaurant and we were invited to help ourselves to as much as we wanted from a table laden with continental goodies including jugs of fruit juice, cereals and mini pastries. Despite knowing we were going to be ordering a cooked breakfast we couldn't resist grabbing a couple of cinnamon swirls and danish pastries each. They looked too good to leave behind! The Cooked Breakfast selection offered a great range of dishes including The Horton Grange Breakfast (the most fully loaded English Breakfast I've ever seen), Eggs Benedict, Porridge and Toasted Teacakes. I was so tempted by the Drop Scones which came with a choice of Honey, Fruit Compote or Lemon Butter but in the end decided that I should be sensible and go for something light. 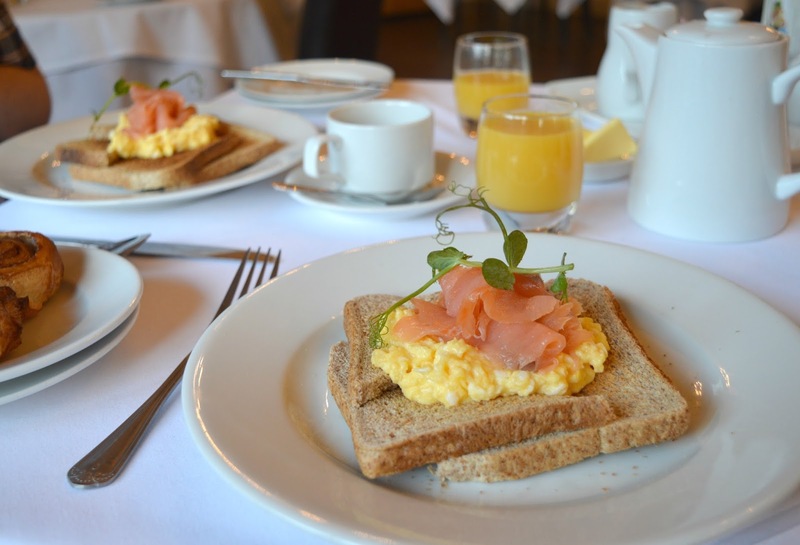 I was a little worried I was being a complete pain when I asked if I could create my own breakfast but the chef was only too happy to oblige my craving for salmon, scrambled egg and a couple of round of toast. 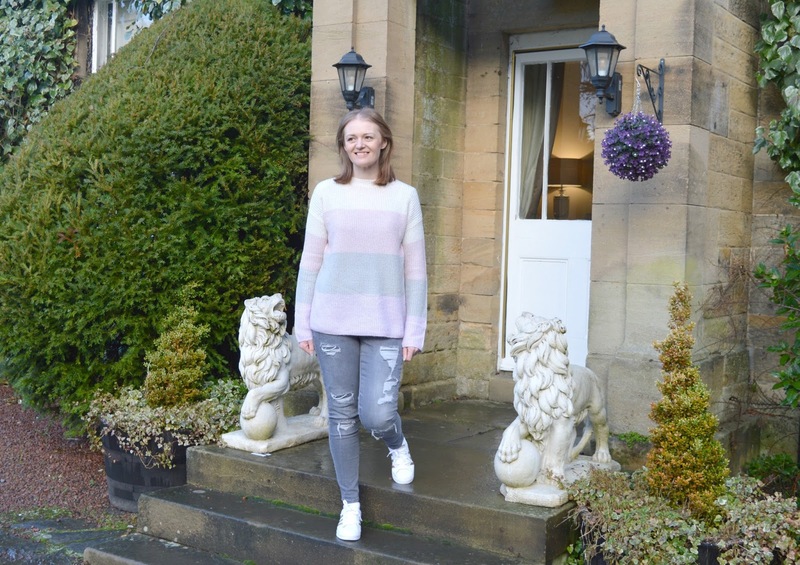 Throughout our stay we were so impressed by how lovely the staff at Horton Grange were, every guest was well looked after and everyone in the hotel was so happy and friendly - it felt like a real home away from home and we can't wait to return soon. With a full range of events throughout the year I think we know where we'll be heading next time we're having a date night! I don't either ... I stacked on a fair bit of extra podge that week! OMG you really need to come up to Northumberland, it is beautiful and so many people don't really know much about it. We have gorgeous coastline, amazing countryside and (of course!) fantastic food! It really is the perfect place for a wedding, I think if we'd looked round it would have been a contender for our venue! It was a struggle but we did it! What a lovely looking place to stay, that bed looks so inviting! 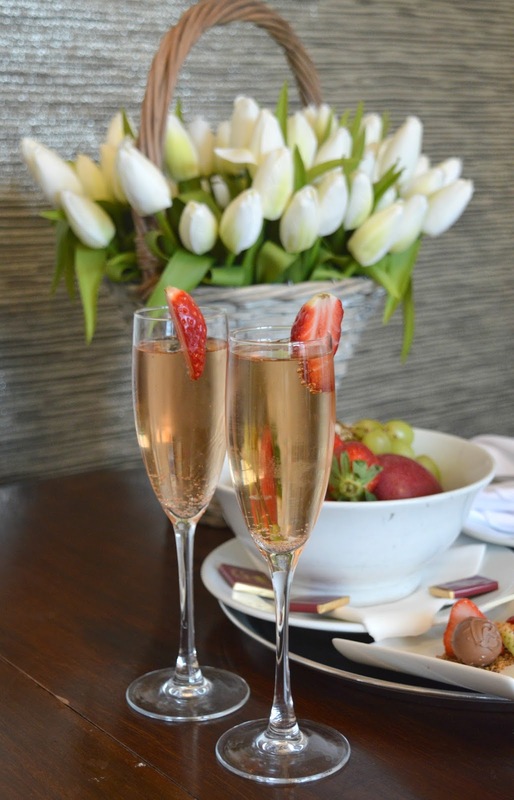 And you can't go wrong with a bonus afternoon tea!